Go to the next level in the Dragon Ball Z saga. 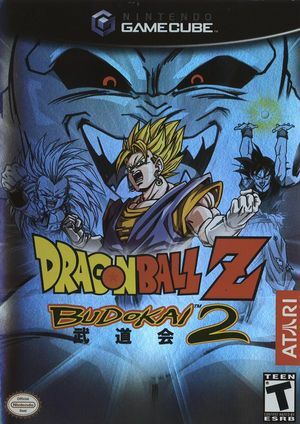 Dragon Ball Z: Budokai 2, released as Dragon Ball Z 2 (ドラゴンボールZ2 Doragon Bōru Zetto Tsū) in Japan, improves upon the first installment by adding an all-new single player mode, new characters and explosive attacks. Experience the new match-ups, character cameos and challenging missions in "Dragon World." Pick your favorite DBZ hero or enemy and take on a friend in "Vs." and "Tournament" modes. If you're really good, you will soon come face-to-face with Buu, the most lethal DBZ villain. Dragon Ball Z: Budokai 2 forces interlaced rendering causing it's output to jitter vertically. Dolphin doesn't currently support interlaced output and attempts to convert all output to be rendered progressively. When progressive rendering can't be forced delinterlacing doesn't occur appropriately causing output to shift up a row for one frame and back on the next. Refer issue 10473. The graph below charts the compatibility with Dragon Ball Z: Budokai 2 since Dolphin's 2.0 release, listing revisions only where a compatibility change occurred. 4.0.2 Windows 7 AMD FX-6300 @ 4.1GHz NVIDIA GeForce GTX 750 Ti Plays well at a solid 60 FPS. Occasional graphical glitch where characters may look deformed but does not change game play. Settings: HLE Audio, Direct3D11 2x Resolution, Widescreen hack, 2x AA & 16x anisotropic filtering. Played the game for many hours + beat the story mode without any issues. This page was last edited on 27 May 2018, at 23:23.